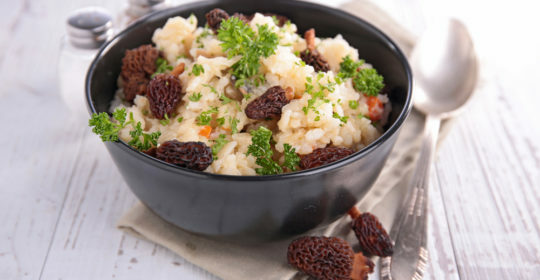 Traditionally an Autumn favorite, organic mushroom risotto can be enjoyed year-round. It’s an excellent meal on its own or can accompany a variety of entrees. Where possible, use organic mushrooms and rice for added health benefit. Be careful not to over season with butter or salt, as the white wine, stock, and garlic will draw out the rich flavor of the mushrooms. Soak the mushrooms in hot water for 10 minutes. (If using fresh mushrooms: chop and sauté in olive oil until nicely browned, remove from heat and set aside to add the mushrooms in Step 10.). Read Dr. Maria Zangara‘s article on the Regenerative Health blog to learn about the nutritional benefits of mushrooms. Come talk to us and get your own personalized nutrition plan with a list of foods and recipe guide. Book your appointment today!